Use layers of stamping, sponging and ephemera to create a beautiful vintage card. Make a standing frame with die cut openings. Make a photo album that folds up into a decorative house. Create a sweet clutch to hold a set of note cards. Create an icy or sparkly background using acetate, glitter and clear glaze. Tuck a photo portfolio in the front of an interactive presentation card. Impress a die into watercolor paper then use the outlines to guide your watercolor painting. Learn the basics for stenciling and shading with sponge daubers. Stamp a matching base and tag for a pretty layered card. 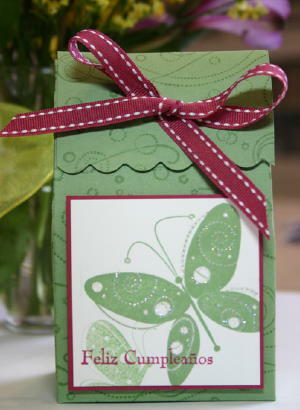 Make a tent card with a clear front. Create party favors with just one sheet of cardstock, some scored lines, and some adhesive. Create an adorable tote to give away 3" x 3" note cards. 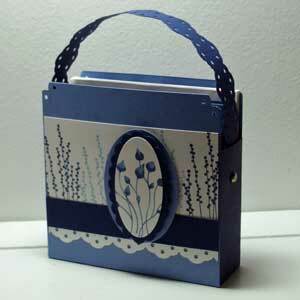 Create this beautiful box to hold your 3" x 3" notecards. Use die cut circles to create a dimensional ornament. Adhere die cuts to create a 3D image. Layer several stamped images to create a 3d look. Create a cute paper pumpkin decoration for your holiday table. Create a 3D look by overstamping your solid image with a slightly darker ink. Is there a technique or project you'd love to see a tutorial for? Contact us and we'll try and get it added. There's an entire SCS gallery devoted to samples of the techniques you'll find on this page.